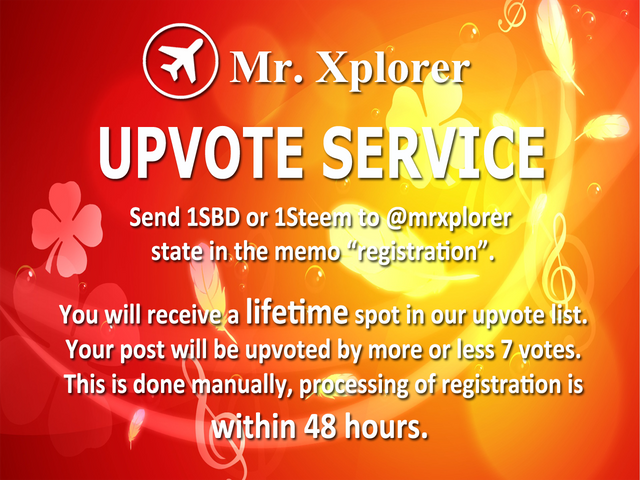 Mr. Xplorer Upvote Service: Congratulations To First 6 Registration. @mrxplorer would like to congratulate the first 6 steemians who registered with Mr. Xplorer Upvote Service. They are now included in our curation list for life. Their posts will gain additional upvotes from now on. Again congratulations the first 6. If you need more information you can read What is Mr. Xplorer Upvote Service? I will continously give updates who are now member of Mr. Xplorer Service. I am looking forward to help our members more. I am also planning to give rewards and hold contest to share the fun in building our community. ✅ @mrxplorer, I gave you an upvote on your post! Please give me a follow and I will give you a follow in return and possible future votes!